This ABS Heavy Duty Plastic Dog Crate Pan is rustproof ABS plastic. This Heavy Duty Plastic Dog Crate Tray is easy to clean, no corrosion, lightweight but heavy duty. Note: The dog crate replacement pan shown might be a slightly different shape from actual dog crate replacement pan. 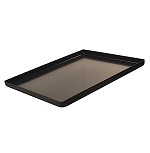 The image is to show you that you are purchasing a dog crate replacement tray.